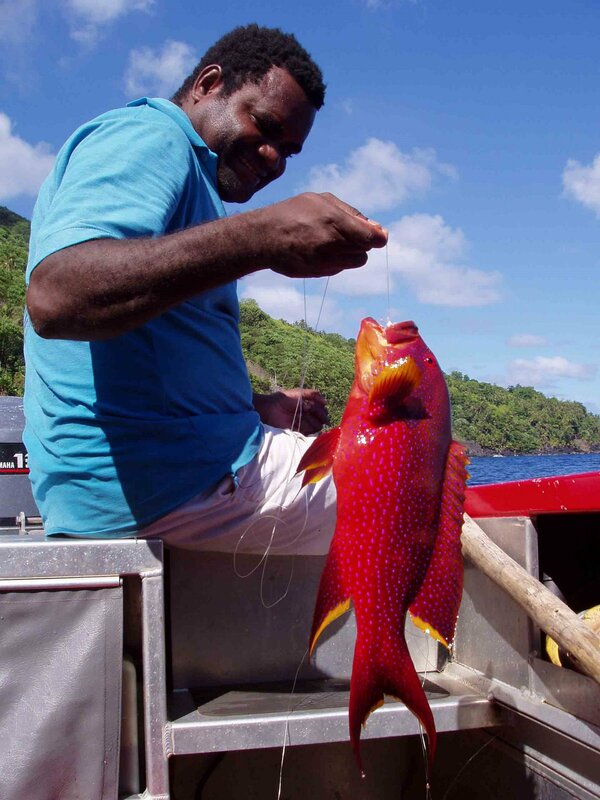 Thought I’d post a bit about eating in the Solomon Islands. 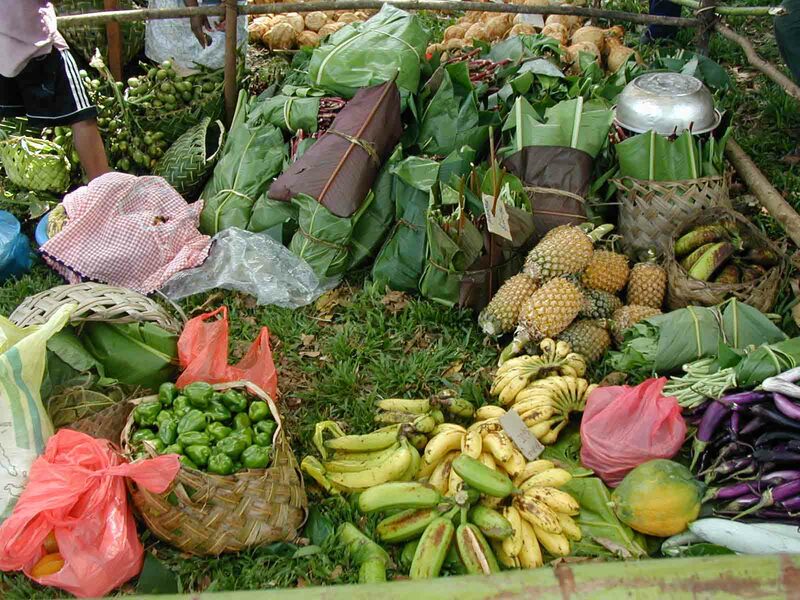 Although the Solomon Islands are technically a third world country, there is plenty of food around. The food is of course available seasonally – e.g. you can only really get crab during a new moon and when it wanes, and there are times when ‘breadfruit’ (vile vile vile) is the only thing available. We were lucky in our time of going when there was relatively a lot of selection about. Unfortunately due to the extensive logging on Lata there had been a huge increase in the amount of rainfall and the locals fear that come April 2008 there will be nothing to harvest. I’d never really thought about food like that before. We lived on food from the market: green peppers, aubergines (eggplants), snake beans, spring onions, cucumber, cabbage (leafy things, not in heads like at home) coconuts, pineapples, bananas, star fruit (5 corners is the local term), papaya. We got few supplies from the shop: soy sauce, rice, biscuits, sugar. A woman in the village made bread, which was too expensive for the majority of the locals to buy, and it was strangely sweet and chewy. I wasn’t a fan, but TLM liked the odd roll. The market was always interesting – you could go at 5am (everything is sold by 6am) and there be nothing there, or could mosey along at 11am and find a whole load of stuff. After a matter of days I got savvy about when a truck came along from out-lying villages with fresh vendors. The only vegetable of note really were the cucumbers that you had to peel, were about 3 times the diameter of our cucumbers and had enormous pips you could crunch on. With everything being organic and fresh the fact that the food is pretty bland didn’t matter so much. We tended to avoid the ‘sweet potatoes’ as they were fibrous, chewy, dry, tasteless and pretty much horrid. nothing like our ‘yams’ (which I insist on calling now to make the distinction). The only time I liked the potatoes was when they’d been baked in a traditional oven and were practically charred black. After much conversation, it seems that their sweet potatoes are roots, rather than tubers and there was a heated discussion in the staffroom about what an English potato must be like. Our first fish was a very very small red snapper which we bought from the fishermen just as they were stepping out of the boat. They laughed that we whitefellas were having such a small fish for tea, but we were content and they were glad to have it off their hands. We had to sort of swing it on the way home (the locals use a bunch of leaves) to keep the flies away. It was the first fish I ever.. dismembered. It was delicious, added to the fact that I bumped into one of my students on the way home and she gave me a ‘lemon’ to have with it. The lemon was in fact green on the outside and orange on the inside and tasted like a cross between all the citrus fruits (lemon/lime/orange) but was surprisingly soft and smooth tasting. We loved picking these and having them in water to jazz it up. no wonder they were laughing at how small our red snapper was! The cooking facilities were terrifying. 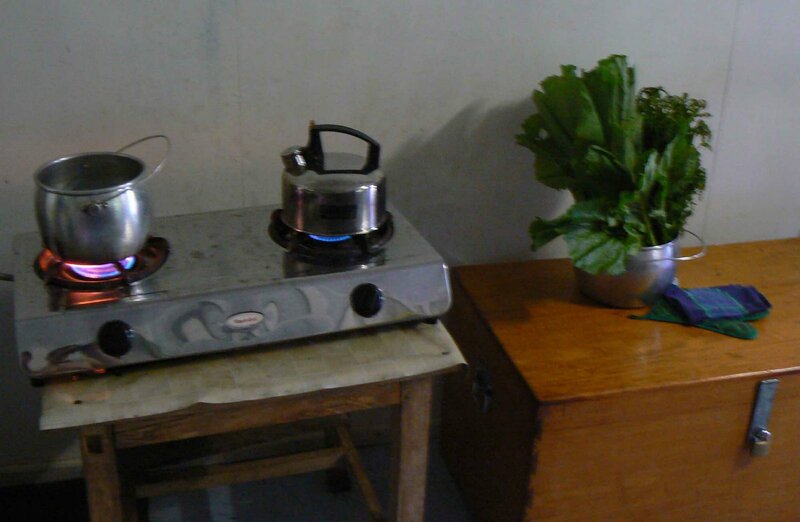 We were lucky to have a modern gas stove and pans, but they scared the crap out of me every single time I cooked. This was not helped by the fact the gas canister was a mere centimetres from the naked flame. The hobs themselves had a setting of puny or violent (you can almost see that on the photo) so it made cooking an experience! The traditional oven – where they cook the potatoes – was a much more sedate affair but a lot more effort. I can’t say I ever managed to cook in one, but I sat in the hut it was in and chatted while the potatoes cooked (I remember telling them about Henry VIII and his many wives, each time I mentioned a new one they gasped and couldn’t believe England had such a naughty King). The tongs are just made from snapped bark – simple but effective. As you’d probably expect we did a bit of fishing and ate a LOT of fish. There are two distinct varieties: reef fish and deep sea fish. Reef fish are rather fishier and flimsier than deep sea fish. Reef fish tend to be barbequed and then pulled to pieces by greedy fingers. I did feel a bit guilty for eating some parrot fish (the cute ones with the beaks that nibble on coral) but they tasted so good. The deep sea fish are the ones you troll for (string a line out the back of the boat on your way somewhere) and are things like red snapper, tuna (skipjack and yellowfin) and barracuda. They are the ones you tend to put into soups and stews and they are meatier. I was a bit traumatised by how long the deep sea fish lived for in the boat, flapping around for almost half an hour if you don’t whack them dead, bleeding, alternately lying still and fitting violently. I was shocked at how big the barracuda’s teeth were and just how deft the fishermen were at removing the hooks, smacking the fish dead and dropping the line out again. I was in awe when we were in the storm and they were trolling out the back or clambering over the front of the boat. I also ate giant clam which was a bit like oyster, but so so soft it melted in the mouth (it’s also endangered but that doesn’t seem to make a difference). I missed out on turtle (phew) but loved the coconut crabs – though again I didn’t like killing them very much. I’m so glad I missed the killing of the pigpig (Rosie, RIP) but they live a fine life eating themselves fat and lying in the shade of the trees they’re tethered to. next time I’ll post a bit about what food was actually made from all the raw ingredients. What gorgeous fish. 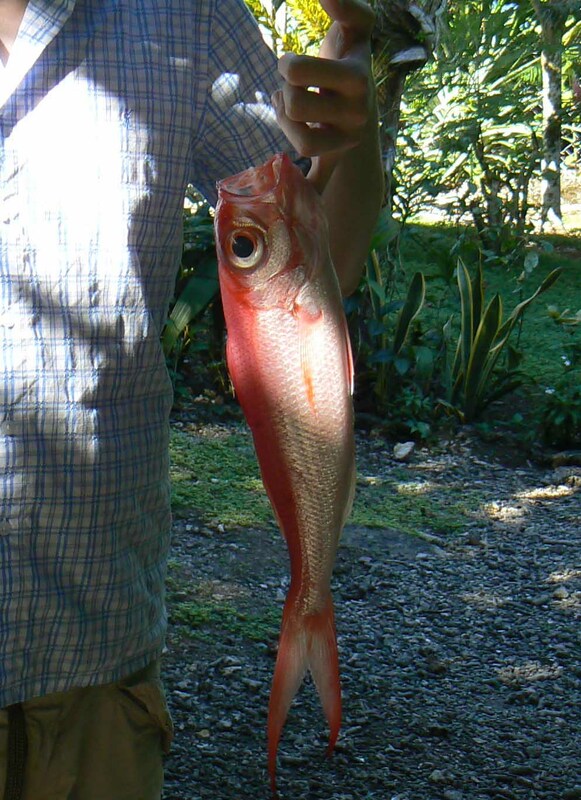 Those were some awesome red snappers! 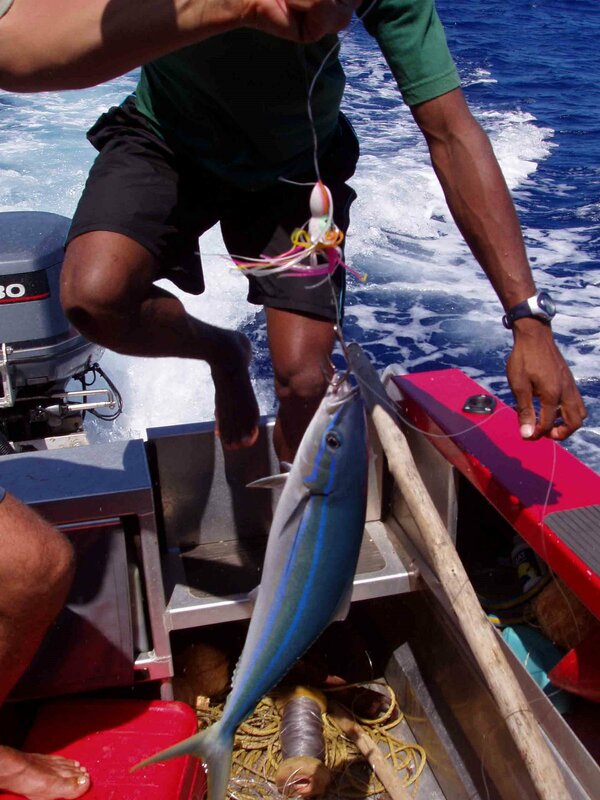 I remember seeing big ones almost that size in the fish markets in Asia.